A JenClothing EXCLUSIVE--you won't find this dress anywhere else! This pretty little number is a fun twist on a classic style. The Lucy dress features a round neckline & cap sleeves with a fitted bodice & princess seams tapering to the waistline. The skirt is made up of 3 layers: a soft, semi-sheer chiffon, followed by a full lining, and finally another lining with a tulle ruffle at the bottom to form a built-in "petticoat!" So fun! You'll love the added "pouf" and vintage flair, plus the perfectly figure-flattering shape! 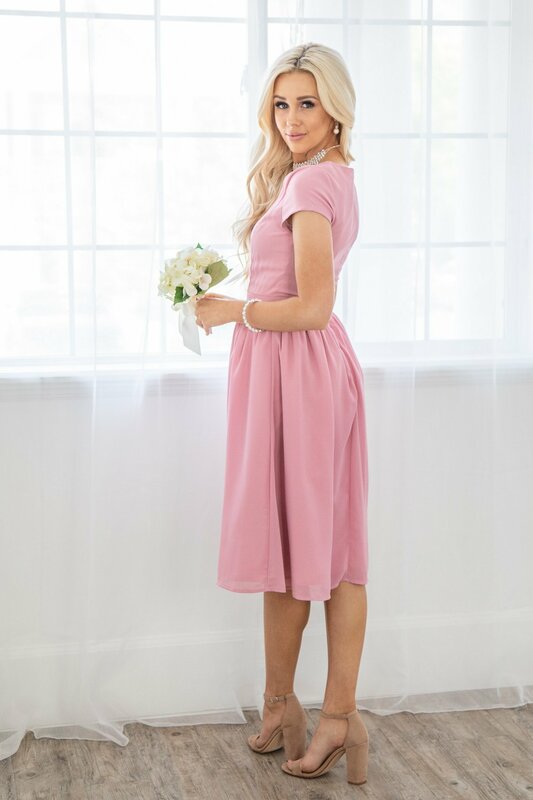 The pretty Blush Pink color is perfect for parties, semi-formal dances or as a modest bridesmaid dress! Also available in Navy Blue and Dark Green. Length: From top of shoulder to bottom of dress: XS-43", S-43.5", M-44", L-44.5", XL-45", XXL-45.5"
*Please note there is only the pink color you see in the picture. The color names are all alternate names for this color.